Russians are becoming an obvious fixture in the community of Pattaya. No matter which soi you turn down or small shop you enter, you are likely to hear at least a few words of Russian being spoken. Thai people are always eager to share their music, food and culture with their Russian friends. On Friday, we were able to once again get a glimpse into Russian culture. 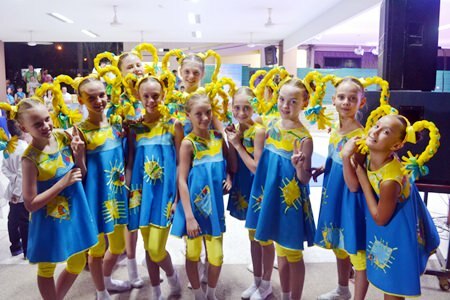 Our World Cultural & Educational Center, based in the eastern Russian city of Vladivostok, hosted a Russian cultural show on 28th March at the Father Ray Foundation on Sukhumvit Road. This was the third time in a year and a half that Russian talent was on display in Pattaya. All girls dance troupe performing a contemporary dance routine. Children’s groups from all over Russia once again descended, bringing a little taste of Russia with them. Russian culture is as unique and distinctly regional as Thai culture. Each performer brought their own unique talent and flair. Performances included traditional dancing, singing and some major acrobatic routines. Participants ranged in age from 3 to 17 years old, all with enormous talent for their age. 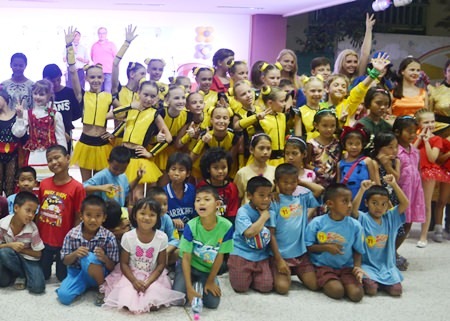 Children from all of Father Ray Foundation projects came to enjoy the show and meet others their age from a different country. The look of astonishment and disbelief on some of our youngsters faces when they saw the acrobatic talent on display was hilarious. Many of our young girls proceeded to see just how difficult it was to try to do the splits. Children from Russia and Thailand, finding common ground in song and dance. Father Ray Foundation and our children look forward to the next time we can be under the Russian fever spell. And next time we will be ready with our own set of performances. Fr. 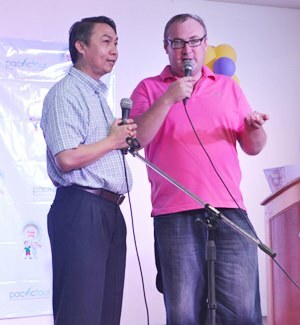 Peter Pattarapong with Alexander from ‘Our World Cultural & Educational Center’. Young Siberian dancer in traditional costume.